We talk a lot about the virtues of making a muslin, or a toile, here on the blog. A muslin can enable you to check the fit of a garment before you cut into your garment fabric, and it helps you to envision how the finished garment will look without investing time in sewing all the details. So here’s today’s sewing small talk question: How often do you make a muslin when you sew for yourself? And be honest, now! I’ll start. I almost always make one because I need to when I’m developing a new pattern. Because I’ve already made muslins for the dress form during the pattern development process and because I’m very close to our sample size (which is really convenient), I know what adjustments I’ll need to make when I sew the pattern for myself. What about you? How often do you test a pattern first by making a muslin? I should make a muslin for every time I use a new pattern but don’t and it often comes back to bite me. Case in point: a rub-off of a favorite pair of overalls that I cut out and went for broke sewing up. A muslin would have told me I had made the waist too small and the bib too wide. The garment is almost done but it’s in “time-out” until I simmer down. Or maybe it’s me that’s in “time-out” until I simmer down. I can fix it, just don’t want to tackle that right now. Next up is a new to me skirt pattern and I “will” be making a muslin out of unloved fabric before I cut into my beautiful Japanese cotton. I never use muslin fabric. Instead, I repurpose old drapes and sheets and make a test garment. This lets me practice all the technical aspects before cutting my real fabric. Sometimes I even use an old fabric from my stash. Right now I’m using a quilting cotton from my stash to fool around with a classic shirt. Sometimes I get lucky on the first go and they fit. Even if they don’t, I have a complete garment that I will donate. If I make a garment and it fits right out of the gate, I make another, unless I hate it. I quit using muslin as it’s just too expensive and it never has the right drape. I rarely sew for myself…. I think if I WAS trying a new pattern, I WOULD make a muslin copy because I tend to be reluctant to cut into beautiful fabric. I often wonder if I purchased a dress form (is that what you call it these days? I’m 70 and learned to sew when I was 12, so I’m not very current with all sewing accessories) that I WOULD sew more for myself? I think I would. I love the satisfaction of a finished project. I always make muslins (or samples, as it were) for new patterns and for patterns that I’ve used in the past but that no longer fit me properly. Why? Because standard patterns don’t fit me in many ways. My biggest problem is the armhole and the upper arm. I am very muscular, so I need to adjust the front from the bust point up to the shoulder, I need to lengthen the armhole, and I need to increase the diameter of the upper arm. These are difficult adjustments for me to make, and I am not successful very often, so much to my disappointment, I’ve stopped making garments that have sleeves, such as long-sleeved blouses and jackets. For pants, my waist is larger than the standard hip size, so I always need to adjust the pattern, and I need to make sure that the crotch seam is long enough (and comfortable enough) and that the upper thighs are big enough (yes, more muscles there). Sometimes, I use muslin fabric, but other times I use cheaper fabric so that the sample looks nice. And if it fits, I have a nice garment. Oh, I never do! And I definitely should. More often I make up a garment, and if it doesn’t fit, I give it away to someone it will fit. I feel like I have such precious little time to sew, that when I have time, I hate to delay jumping right in! But it has happened more often than I care to admit that I will sew something together, end up giving it away, and then I’m so frustrated that I often don’t even try again. Last year I made a commitment to myself that I would make muslins to avoid disappointments. I reminded myself how to make a muslin by reading the relevant section in Building Block Dress book, thank you Liesl! While I am still learning what to change when I see drag lines or any fit issues on my muslin, it’s been really helpful. So yes, I make a muslin! That’s fantastic to hear! Thanks, Liz. I just learned to sew in all the seam allowances rather than draw them. What a time saver! I love my muslins. By the time I get to the actual garment I know what to expect and I feel confident that it’s going to fit. Exactly! Have you tried the carbon paper method? For me it’s must faster than the sewn method. But whatever works for you. I made a muslin of the Cinema dress since it was my first use of this pattern and I wasn’t certain about which size I would need for it. The body measurements on the back of the pattern were quite accurate! Thanks for writing such clear and easy-to-follow directions. I’m making this dress in a blue and white striped linen. I’d love to see when you’re done! I almost always make a muslin. Since I need to adjust for my 6 foot height and DD cup size as well as various other figure adjustments. A muslin also lets me know if I am going to like the style on me and it prevents me from wasting great fabric on a bad fit both size and style wise. I mostly sew for my kids, and they fit into standard sizes just fine, so I don’t have any problems from skipping the muslin. But for me…I just don’t really sew for myself because I dread that I will not fit into it, and I don’t have the time to make a muslin first (cutting out pattern pieces twice, no thanks!). I’m about to try the terrace dress for myself. I’m scared of the bust adjustment! Oh, you can do it! Try it in miniature first, if you want. Once you understand the process it’s not difficult at all. For my kids clothes, I am intrepid and steam right on ahead, erring on the larger side if I’m not sure. They’ll grow into it. For me every new pattern and every resizing ana familar pattern gets a test garment or a bodice muslin because an FBA is a must and a short waist means that the waist and hip lines can hit oddly if unadjusted. Most of the time old sheets, curtains or old fabric from the stash are used rather than muslin, though. Old sheets or other fabrics can qualify as a muslin just as much as “muslin” fabric does. 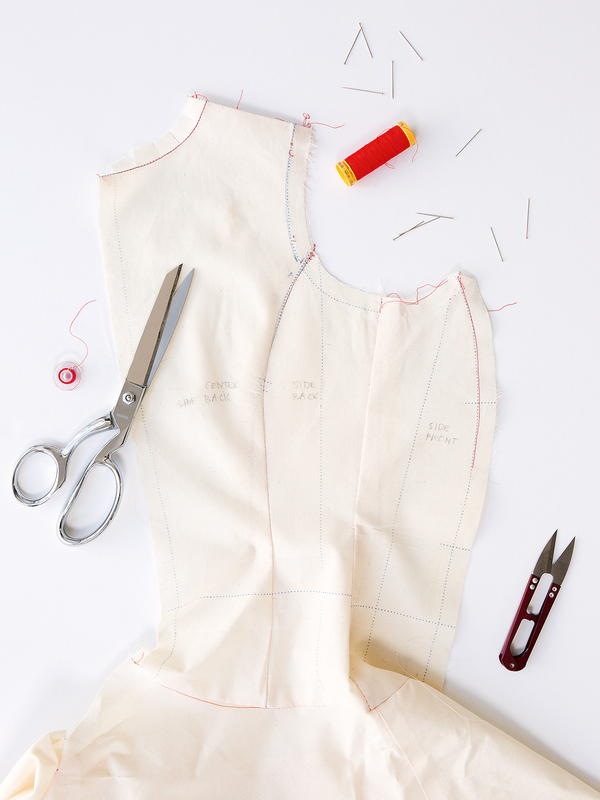 The term really refers to the process itself: making a very basic garment, unfinished, to test the fit. So it sounds like you’re doing it just fine, then! I have never made a muslin because I had never even heard of doing that until Liesl recommended doing it when I asked a question about sizing on one of the childrens’ patterns. And since I was just sewing for small granddaughters, I still didn’t bother. I began sewing clothes for myself this year and the last piece I made was too big, despite my measurements matching the size. I recently purchased beautiful fabric to make the Gallery Tunic so when this blog post came out last week, I felt it was a sign that I should make a muslin before cutting the beautiful fabric. So I’m in the midst of it now and have found the comments really helpful. Thanks all.